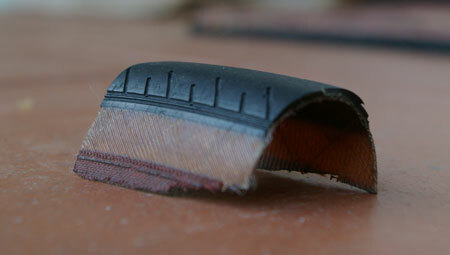 An old piece of tire works great for patching a blown tire (within reason) to get you home. Cardboard--even money--can work in a pinch. As I was cruising down Hwy 1 approaching Davenport, I saw a cyclist walking his bike. Bike trouble? Normally I wouldn’t stop because if you need help, you’ll yell. However, at my blistering pace I figured I’d be by him before he could say a word, so I slowed down and asked if he was having tire trouble. Hwy 1 is no place to be walking as cars zoom by. Sure enough, the youthful rider had a blown tire caused by a near collision. Slamming on his brakes ripped a hole in the 21-mm tire. The rider said there was nothing I could do to help, but not so fast. I carry a “boot” and have for many years after suffering a similar fate of a blown tire. I pulled out the old piece of tire and told him he had to do the heavy lifting while I watched. This novice rider managed to remove the tire and insert the boot, but needed a little coaching with putting the tire back on. At all costs, avoid using the tire iron to put the tire back. It’s a great way to pinch the tube. Our fair-weather rider also didn’t have a pump, so I had to do the pumping. Nobody uses my Silca pump. In the hands of a novice, my priceless pump would be in serious trouble. The boot worked great, although his cheesy tire had blown cords from the hard braking. My advice is to use at least 25-mm wide tires. If this rider takes my advice, he will visit Tom Sullivan at Amsterdam Bicycles in Santa Cruz. Tom can set him straight on what gear he needs to bring along on the ride. A boot is one of them. This entry was posted on March 4, 2012 at 5:25 pm and is filed under Repair. You can follow any responses to this entry through the RSS 2.0 feed. You can leave a response, or trackback from your own site.